Pizza delivered straight from your refrigerator. How great does that sound? 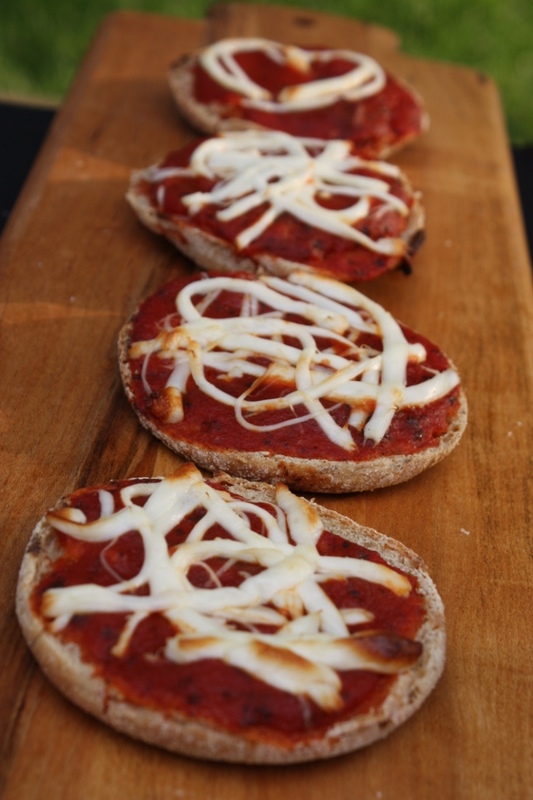 The great taste of grilled pizza with everyday items you probably already have in your refrigerator! No need to walk any further than your fridge or wait around an hour for delivery to begin putting together a pizza. It is very important to preheat your grill! Turn your grill on high and make sure you vertically brush the remains from any previous meal off the grates of your Q. Once your grates are cleaned off bring the temperature back down to 350 degrees Fahrenheit. Take the English muffin and put it facedown on the grill. Toast for 30 seconds. 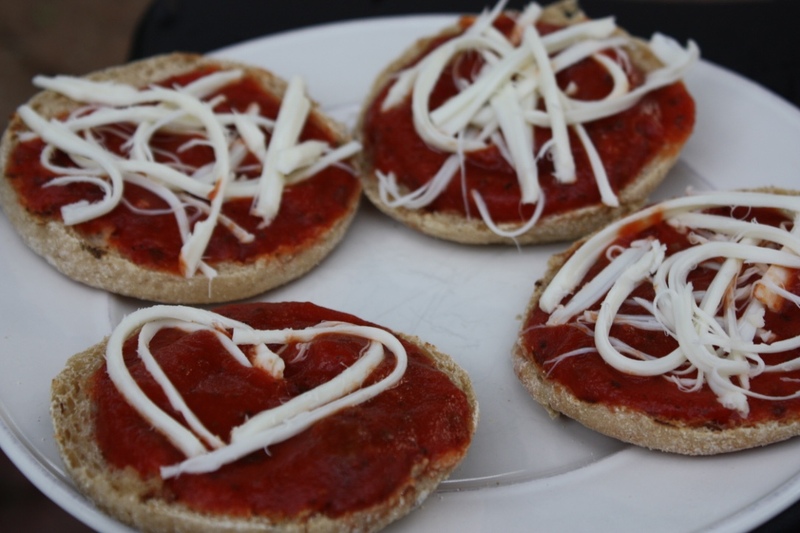 Remove the English muffins from the grill and place them on a plate and add the tomato sauce. If you like lots of sauce on your pizza put lots of sauce on your English muffin! Then, if you decide to use string cheese, separate the string cheese into thin strips and place them onto the sauce on your personal pizza. You can also use packaged mozzarella. 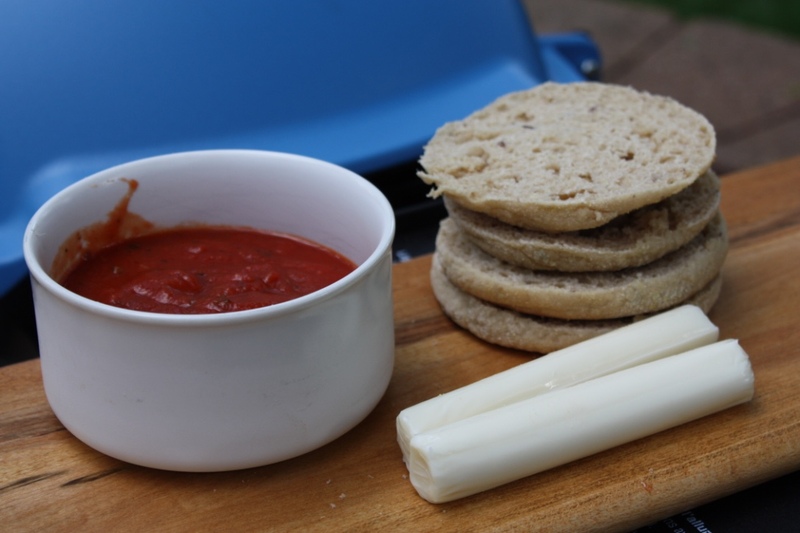 I like using cheese sticks because the cheese is thick and it adds a fun creative touch to your personal pizza! I made a cute little cheese heart on one of my pizzas, but let your imagination run wild with the string cheese patterns! After you finish your cheese mural, place the pizzas back onto the grate. Turn the temp down to low! Grill the pizzas on direct heat for six minutes then move the pizzas to indirect heat (away from the flame on the outsides of the grate) for 6 more minutes. If the cheese is not quite melted leave the pizzas on for another minute or two. Once the cheese is melted. 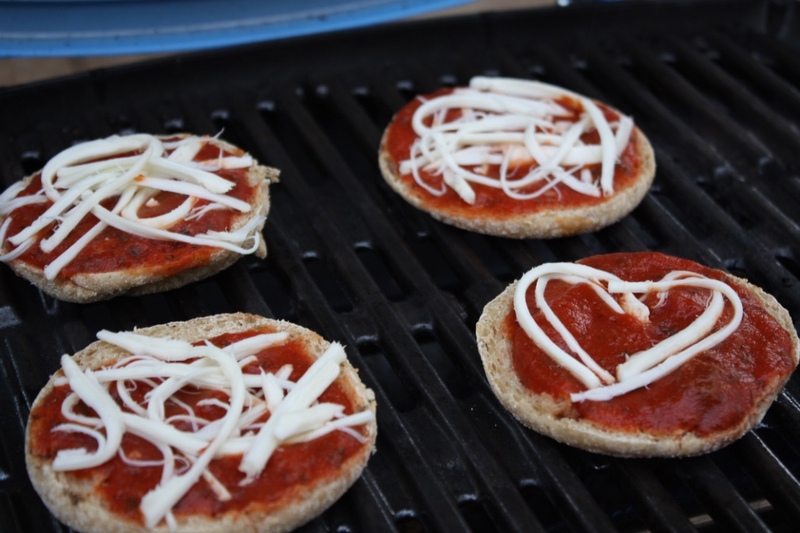 Use a spatula to remove the personal pizzas onto a surface to cool down. While you are waiting for your mini pizzas to cool, take a picture and Snapchat your masterpiece to all your friends—or take it to the next level and Instagram it! Show them your abstract string cheese art you placed on top of your delicious homemade pizzas all made on your Q in color! It’s not a bad thing to show off every once in a while…. Once the temperature of your pizza cools down, it is time for you to enjoy each personal pizza and the nice smoky flavor the grill adds!